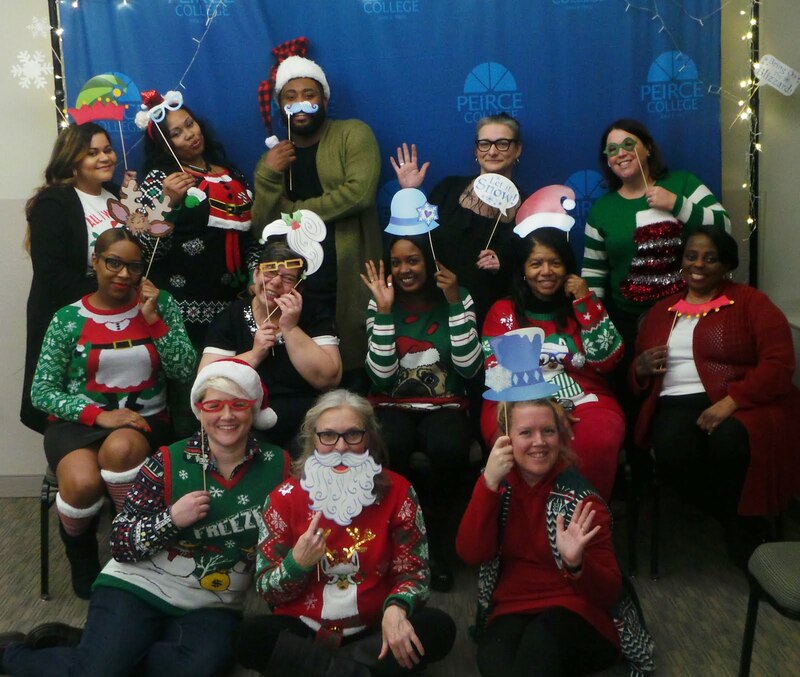 In addition to the six professional associations mentioned in the November Health Programs blog feature, Health Programs students at Peirce College are offered yet another way to get involved outside the classroom to expand their network and build their resume. The Health Programs Student Association is the perfect way for all health-related majors to meet fellow classmates and further develop their relationships with the faculty. Who can join? Each and every student at Peirce who is enrolled in a health-related major is welcomed as a member of the Health Programs Student Association at Peirce College. The group has a strong and solid foundation of students who are interested in meeting each other and becoming leaders by lending a helping hand through personal and professional networking, sharing advice and discussing field-related information. On Saturday, December 15, the Health Programs Student Association held its first annual Winter Festival on campus. Health Programs students and faculty had a much-needed and well-deserved chance to relax, unwind and get to know one another better in an inviting and comfortable environment. The party kicked off with delicious hot hors d’oeuvres, holiday cookies, candy, hot cocoa and apple cider. The event was more than just delicious foods and beverages, though! 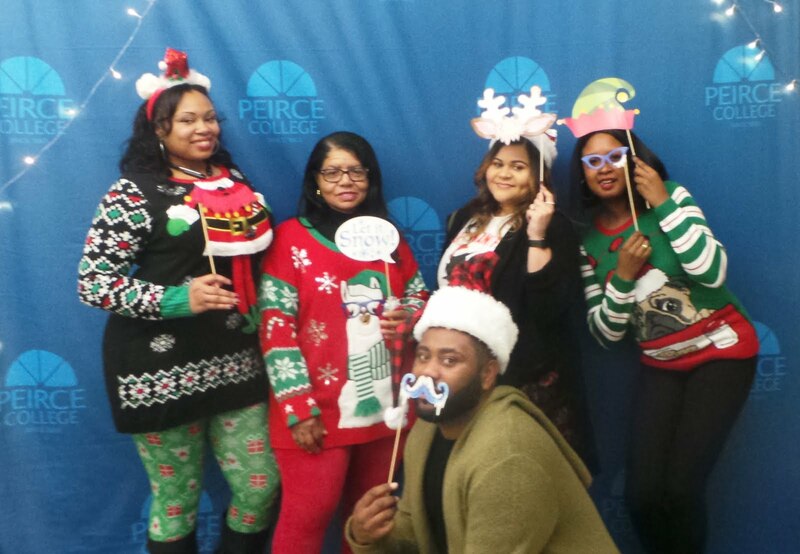 Attendees could participate in a fun (yet informative) Peirce trivia game that shed light on the College’s history and then move on over to the holiday selfie screen to take some fun photos with newly made friends. After the trivia game, photos continued to be snapped, guests continued to mingle and I collected a fun mystery fact from each attendee. The group then played a round of “Guess Who?” This allowed for all participants to learn interesting facts about each other! I read the fun facts out loud as the guests tried to figure out which fact belonged to which guest. The facts revealed some big surprises, including a student revealing a cameo role in the first Rocky movie! The game led to new discussions about our common interests and concerns while offering lots of laughs. Before closing the event, students’ names were drawn for several raffle gifts, including a collection of games and a mini-relaxation kit. The event was a fun and cozy way for students to let off some steam and relax together after a successful session. More importantly, the event helped build bonds within the Health Programs and Peirce Community. All of the faculty and students who attended received one very valuable gift – that of friendship and support. Professors Loggains and I, who act as faculty advisors for the Health Programs Student Association, deeply appreciate everyone who attended, especially the student leaders. Special thanks go out to the students who came early to decorate and stayed late to help with cleanup! Health Programs students can get more information about the Health Programs Student Association (HPSA) by accepting their free enrollment in the HPSA Canvas course. Check back in next month to see what the Health Programs division has to share next!